It is an inactive volcano, which rises to 1,090 m above sea level. The University of the Philippines, Los Baños is designated as the official caretaker of the mountain. 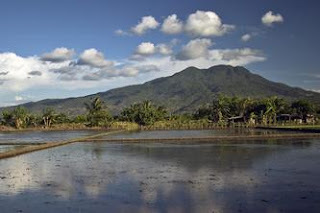 Mount Makeling is a volcano in the province of Laguna on the island of Luzon in the Republic of The Philippines. Legend has it, the faerie princess, Anna Makeling, went to sleep where the volcano stands. From afar, the mountaintop resembles a sleeping woman. Legend has it that she is benevolent and will share everything in her home under one condition, no one's allowed to bring any of it off of the mountain. 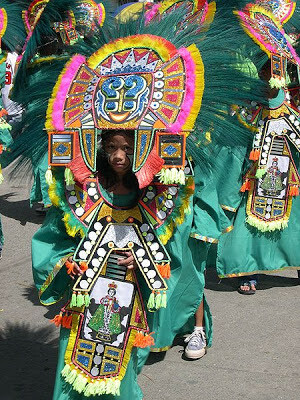 In Aklan, every year on the third sunday of January, we Aklanons celebrate Ati-Atihan in Kalibo --the capital of Aklan. It is a merry-making, street-dancing activity from sunrise to sundown. This is done in honor of Senor Sto. Nino, young Jesus Christ. This festival is one of the most famous and most colorful festivals in the Philippines. Thousands of tourists from all over the world come and join in this yearly festival. 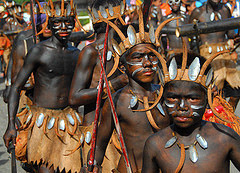 The several groups, called tribes, that join in this festival paint their bodies with soot from the back of frying fans. (When one uses firewood in cooking, one will see black soot at the back of frying fan.) They carry a lot of things from empty bottles to empty cans that make a lot of noise as they walk around the streets of Kalibo. But one of the most important things they carry is the image of the Infant Jesus. A 13th century (c.1212AD) event explains the origins of the festival. A small group of Malay datus, fleeing Borneo, were sold some land by the Ati people, the original inhabitants of Panay Island. The new arrivals celebrated the event at a great feast by painting themselves black to look like them. And also Ati-Atihan's of several nearby smaller towns of Aklan, Antique, and Capiz. Ati-Atihan was originally a pagan festival. Missionaries gradually added Christian meaning. Today, Ati-Atihan is celenbrated in honor of the Christ Child, the Santo Niño. Three days of parades lead up to the main procession that starts in the church on Sunday afternoon. The parades are colorful and vibrant, much like the Mardi Gras carnival in Brazil. Click HERE to see all these colorful tribes !